At Kirk Kirk Law, we understand that a responsible construction worker can wear all the right protective gear and still suffer an injury due to others’ negligence. If you’re one such victim, you’ve come to the right place. Accidents happen, but you and your family shouldn’t have to pay for it. You need a Raleigh construction accident attorney to defend your right to compensation. The most common errors that compromise the safety of the construction site are improper equipment, risky behavior that is not up to standards, and negligence on the part of the site overseer. Poorly maintained equipment, unstable machinery, and lack of safety guards are problems to be fixed by the manager. Construction sites located by highways or roads involve a different type of hazard. Negligent drivers, poor weather conditions, sudden drop-offs, driver distractions, and driving at night all carry potential for a collision with construction workers. Despite the orange cones and directions to drivers, getting hit by a car, truck, or motorcycle is still common among road workers. Reasons vary from irritated drivers to confusing signs and perilous behavior among workers. Falls are the leading cause of construction injuries and deaths. Work tasks often involve heights from roofs, ladders, windows, cranes, and scaffolding. Construction companies are required to have safety provisions in place, but poorly built structures, open sided flooring without fall protection, and improperly used ladders can undermine those efforts. Among the most common causes of long-term injuries and disabilities are ladder falls. Workers may encounter slippery rungs, defective ladders, or unstable surfaces. They may also use the wrong type of ladder for the job or simply lose their balance. Struck by Object – Improper training creates a dangerous environment. Falling objects are a big contributor to construction site injuries. Co-workers dropping tools from above, falling beams, and moving unsecured materials such as concrete blocks can impact an unsuspecting worker and cause serious injury – even death. Electrocutions – Hitting power lines with metal equipment and improperly using extension cords may result from unaware workers who don’t know the locations of power sources. Exposed wiring is common on construction sites and electrocution is a real danger. Caught in or Between – Ignorant workers can be crushed between two collapsing objects, trapped by a cave-in, pinned by a falling wall, or have body parts mangled by unguarded machinery. Power Tools and Machinery – Injuries from power tools are common and may stem from mechanical defects or lack of training in using power tools. A misfire while using a nail gun or improper use of a jackhammer is all it takes to create a life-altering injury. Construction Vehicles – Cranes, forklifts, and trucks are a significant cause of construction accident deaths. Rollovers, backing a truck over workers, and getting crushed between a vehicle and a wall are a few examples. It’s worth noting that while most accidents are handled through worker’s compensation, there are instances where filing a personal injury claim may be possible in the wake of a construction accident. Our construction injury lawyers thoroughly understand personal injury law and have the skill set to defend your right to fair compensation. If you’re the victim of a construction accident that has left you injured, disabled, financially burdened, or resulted in the death of a loved one, call us now. 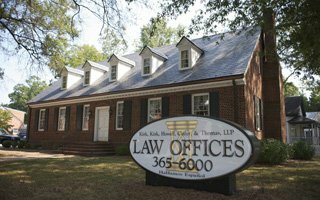 Our professional construction injury lawyers are experts in construction accident litigation and are ready to compassionately and rigorously take on your unique case. Contact us today to take the first step toward getting your life back on track.